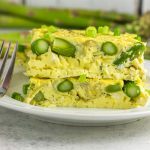 Lemon asparagus artichoke egg bake is a healthy spring breakfast that’s paleo and Whole30 compliant. Packed with veggies and a hint of lemon. Perfect to reheat for busy mornings or to feed a crowd for brunch!